Submitted by Migrate Wizard on 2015-01-22 17:29. ****Filename: SS_Omir**** CURRENT VERSION: v2 **** This is the 5th superset to be released. The tileset follows a desert theme and contains almost 2200 tiles and 460 placeable groups. Many features have been added since Netherwind was released, so keep an eye open for new features. Among the new features added are: Airships, a Roman Temple and many Arabian building models. All texturing is 256x256 pixel TGAs. No DDS files are enclosed. You can use any collection of superset tilesets together and never have to edit a 2da. Model tileset credits: Yumi Chan's water, Mendeku's fortress walls and ravines, Coulisfu's oriental models (castles, buildings and ships), DLA Team's trees, Lord Sullivan's pyramid, Galleons (Shazwoller), Caravels, Longships, Airships (Some_ux), Na (dc_villages marsh and other features), Little Baron's Elven Portal, Adam Miller's & Lucifer Church's Hills, Bloodmonkey's Mountains, Bodangly's arabian city buildings, MG Skaggs arabian buildings, a few Vilance D'Asari desert textures, Gribo's Drawbridge, the Grassmaster/Tom_Banjo Roman Temple, and Daemogorgon's Ruined Castle. If your content is contained within and you don't see your name here, please leave a note. This was one tough cookie to make. It took almost 5000 new model edits to get the tileset into it's present form since Netherwind was released. Thanks to Vilance for the second time. 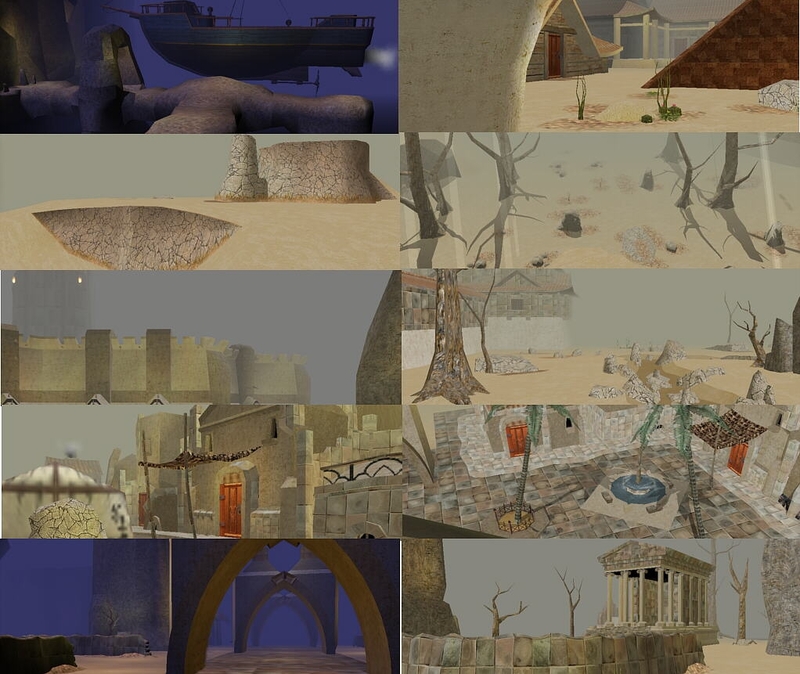 I only used 4 or 5 textures from his Drylands hak, but they made a major difference in the tileset. Bodangly and MGS models are highlighted in this tileset, though don't expect the texturing to be similar. As always, comments and bug reports are welcome. **** Fixed broken pit stairs ground texture.